Can we talk about weather for a minute? Here in Chicago, it’s unseasonably warm. Now, don’t get me wrong, I love warm weather. LOVE LOVE LOVE it. I could live in warm weather ALL YEAR LONG. But my issue is I equally love wearing fall clothes, LOL. I mean, this girl loves a good pair of jeans, chunky sweater, and some boots. My fear is we’re going to skip fall completely at this point and go from warm weather to freezing cold. And at that point nobody will see me in my cute sweater and boots because I hibernate come cold, snowy season! And let’s also talk about food. I love soups and easy crock pot meals. 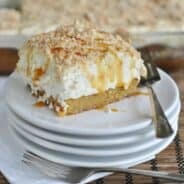 Apple and pumpkin desserts are my JAM this time of year! So, while the sun is shining and I’m wearing shorts and a tank top, I’ll continue to enjoy ALL THE APPLES in October. Welcome back to APPLE WEEK my friends! You may remember on Monday I shared this Apple Cream Cheese Tart recipe, and announced that Jocelyn from Inside Brucrew Life and I have partnered up this week to bring you all the apple recipes! Crunch Pak apples has recently started selling APPLE RINGS and I couldn’t be more excited. Not only do I love their easy, sliced apples for snacks, but the apple rings are so fun too. First, they make a great snack. Spread some peanut butter on top and add granola for an open faced apple sandwich! Or make an easy Caramel Apple Cheesecake Tart like Jocelyn did earlier this week! 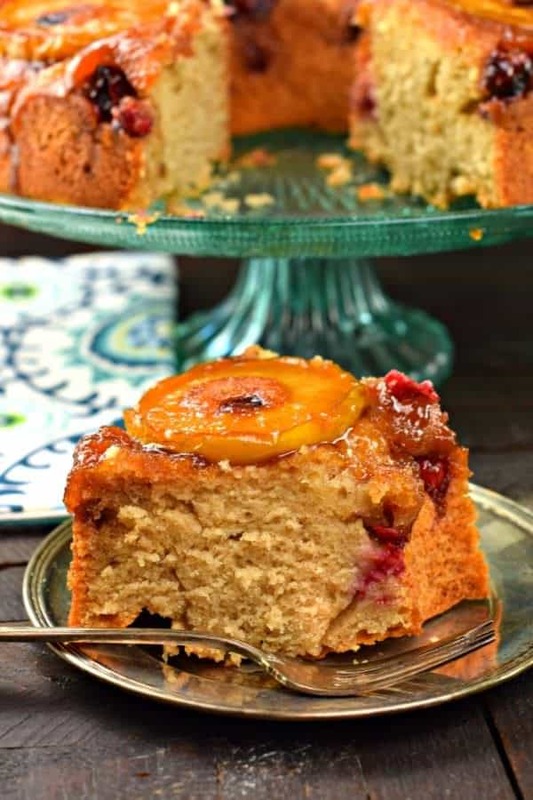 OR…better yet, make this impressive Apple Cranberry Upside Down Bundt Cake. I’m sure you’ve all heard (or enjoyed) and upside down pineapple cake. Am I right? 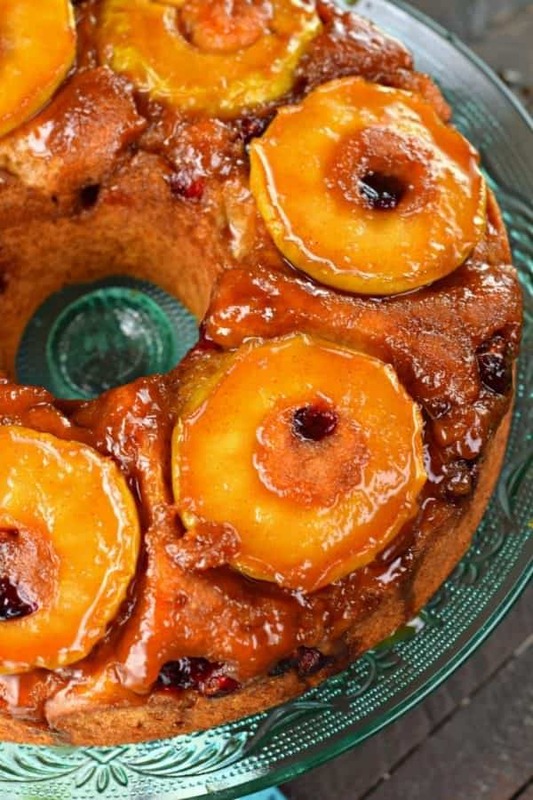 That gooey brown sugar topping with the caramelized fruit? I took that same concept and used apples! To make this a spectacular holiday treat, I added cranberries! 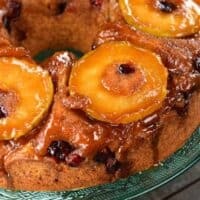 Such a fun, seasonal touch, that’s totally optional (but similar to an upside down pineapple cake that has cherries, I thought cranberries would be a great twist)! Start with a large tube pan or bundt pan. For a “flat top” look I used this pan. It’s typically used for Angel Food Cake, but it worked perfect in today’s upside down bundt cake. You can also use a bundt pan (this one is my favorite). 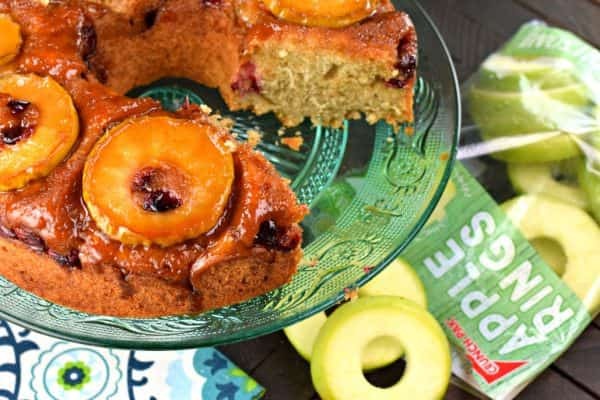 You can choose to lay the apples flat or place them vertical in the bundt pan grooves and pour the cranberries in to help support them. Then pour your batter in like you normally would! SPRAY your pan. Do not be skimpy. You are making a gooey brown sugar caramel sauce…and unless you want to lose the entire top of your cake, spray the pan. And then spray it again. Or use grease, and be generous. Once you’ve baked your cake, remove it from the oven and let it cool in the pan for about 10 minutes. Then use a cake stand or flat plate and place it on top of the cake pan. Flip it over (together, like in my video) and slowly let the cake release itself, sliding the pan up while the cake remains on the plate. Quickly fix any mistakes and fallen cranberries. Then smile and breathe again, because if you’re like me, you held your breath the whole time! Store this cake at room temperature, covered. 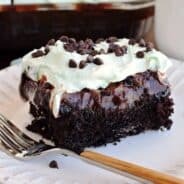 It’s delicious with a scoop of ice cream or some fresh whipped cream too! ENJOY. Come back tomorrow to see what other recipe I’ve created using Crunch Pak Apple Rings! 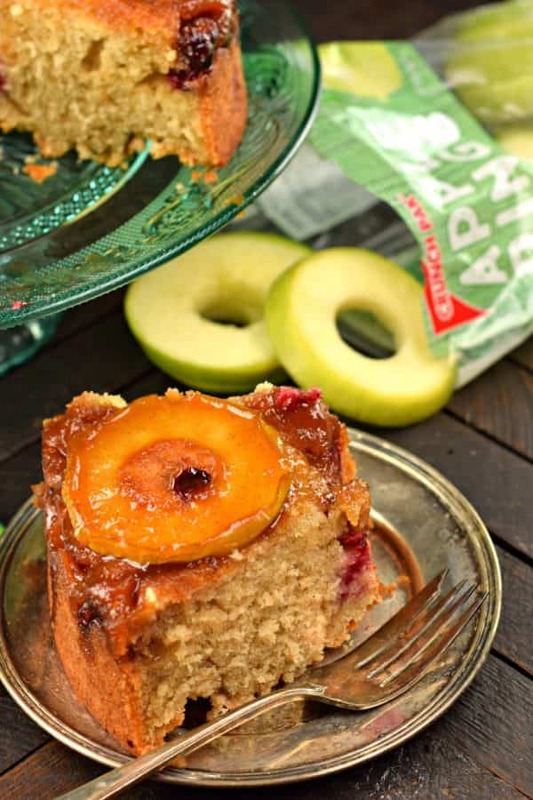 Be sure to head over to Jocelyn’s blog to see her recipe for Upside Down Apple Cake today. We really share the same brain sometimes! 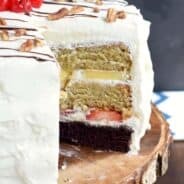 You’ll love her delicious twist on this delicious cake! 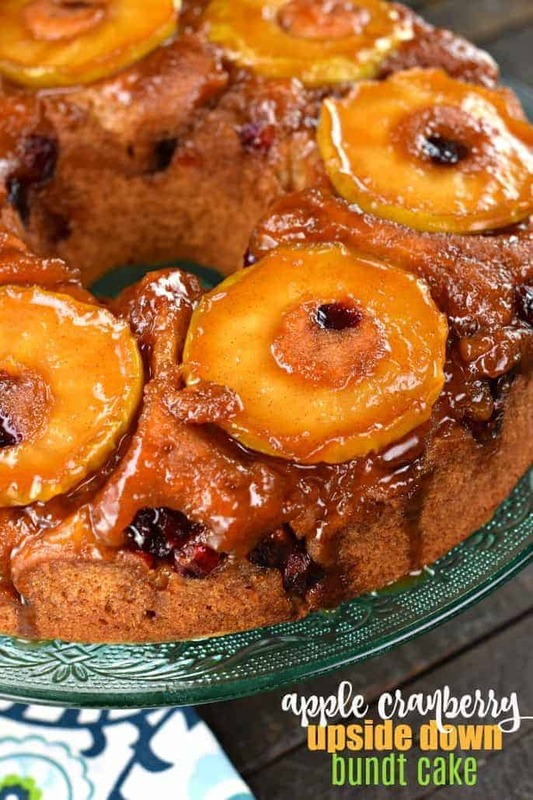 Welcome Fall with this Apple Cranberry Upside Bundt Cake recipe. Move over pineapple cake, there's a new twist to a classic recipe just in time for the holidays! In a small bowl, combine melted butter, brown sugar, and cinnamon for the topping. Line a layer of apple rings in the bottom of the prepared bundt pan. Sprinkle with cranberries. Pour brown sugar mixture over fruit and set aside. Pour cake mixture into prepared bundt pan. Bake for 50-55 minutes until browned. Allow to cool in pan for about 10 minutes, then flip onto a cake plate and cool completely. Slice and enjoy! Store at room temperature, covered, for freshness. The most foolproof way I’ve found to make sure nothing sticks to the pan is to grease with shortening and then coat with powdered sugar. I will use apple cranberry juice. That is my way of baking, using fruit juices. Karen, I must try your method of not sticking. Great substitution! Hope you enjoy it! Damn, this looks so delicious! I’m already saving this post so I can try the recipe this weekend. Thank you for sharing it! I love spice cake with applesause. I am going to make your toppings but use a boxed spice cake. And instead of rings use slices. I want more apple on top. Will let you know how it turns out. Will send a photo also. ENJOY! can’t wait to see how it turns out!